Singer-songwriter SARAI hails from Coffs Harbour, on the east coast of New South Wales. SARAI has spent years honing her craft by pouring her soul out into her records day after night. She signed to Source Music for the release of her debut single, “Get To You”, which was immediately added to Spotify’s New Music Friday playlist and most recently to Billboard Magazine’s ‘2018 Pop Songs You Might Have Missed’ playlist. 2018 was a huge year for SARAI with consistent single releases generating hundreds of thousands of streams on Spotify, Apple Music and with placements in the Channel 10 series ‘Playing For Keeps’ and a Glassons online branding spot. Keeping that buzz going into 2019, the talented singer-songwriter and dancer just can’t keep still working with artists like JVLY, YOMI TWICE and JUST A GENT. Prior to the release of her highly-anticipated EP, SARAI will release the energetic "STARXLOVERS" this Friday, exploring the question of commitment between lovers over time. One of SARAI's most honest and reflective works, "STARXLOVERS" is sure to take over your body and your soul. After bursting onto the scene with consistent releases in 2018, SARAI is keeping up the pace as we kick start 2019 with STARXLOVERS off her highly-anticipated upcoming EP. 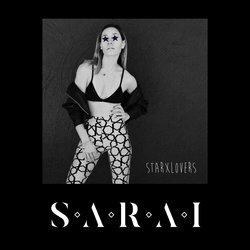 STARXLOVERS explores the question of commitment between lovers over time, SARAI's most honest and reflective work to date.